DualFit Pipe Fittings » Rovi Products, Inc.
Part Nos. of Fittings made of Brass end with a “B”, those that don’t are made from Acetal. 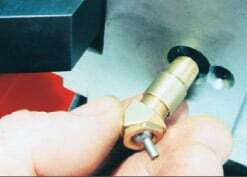 DualFit brass adaptor allows PressureMax nozzle to be used in screw-lock socket having BSPT port. Adaptors are great for mounting TurretJet and PressureMax nozzles in counterbored ports.